Advance Takes on Designing Fluid Interfaces a WWDC session that’s not to be missed. This is a guest post by our Summer 2018 High-School iOS Intern, Pranav Wadhwa. A student at Thomas Jefferson HSST, Pranav is a young, enthusiastic iOS developer who spent the last five weeks developing apps for 3Advance. Apple has always been a pioneer in the design field. One of their primary goals in designing the products we use everyday is ensuring that they have interfaces that feel fluid and natural to users. The iPhone X does just that. It is important that app developers continue the use of fluidity in design, as it makes the experience even more delightful for users. This wonderful, comprehensive lecture explains to us how to create fluid, natural interfaces for our mobile apps. 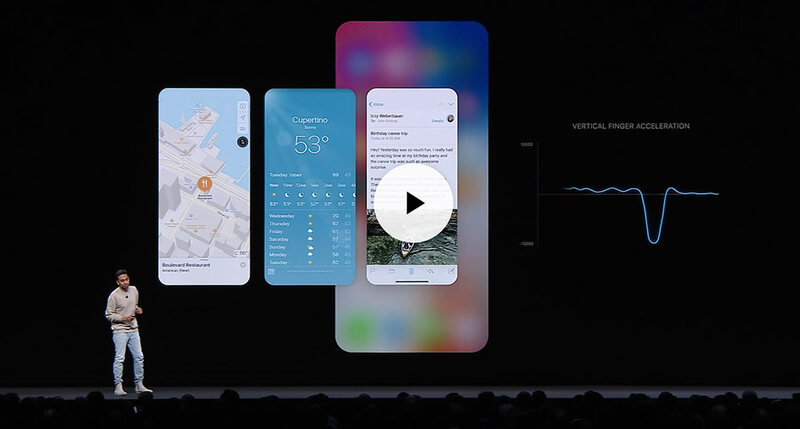 Imagine swiping through your iPhone’s home screen and finding a one second animation for every gesture. The timed animation causes the user to lose interaction for that duration, resulting in a device without a fluid interface. Thus, responsive or dynamic motion is crucial in a mobile interface. Apple bases its devices’ dynamic behaviors off of characteristics in the physical world. As a result, their interfaces are intuitive and, consequently, fluid. 3. Mobile App Users have to learn gestures. Though gestures are fantastic means of interacting with content on a screen, they aren’t always apparent to the user. Displays such as page indicators and grabber handles help convey the idea that gestures can be used. Additionally, floating content through the use of shadows also tell the user what content they can interact with. Gestures must also be reusable; when a user learns a gesture once, they should be able to use the same gesture across the app/device. Thus, consistency is crucial when considering design interactions. “Three Advance Takes” is a blog series where someone at 3Advance reads something interesting and we chime in with our opinion. We develop apps, but we also eat, sleep and breathe technology, believing that the more we know, the better we are. Drop us a line. We’d love to hear from you.